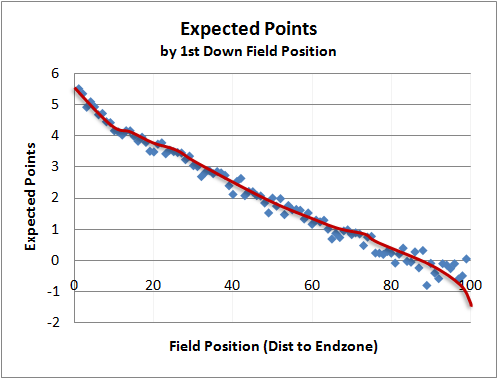 This post will explain the concepts of Expected Points and Expected Points Added. In future posts when I refer to these stats, I'll link here. Football is a sport of strategy and decision making. But before we can compare the potential risks and rewards of various options, we need to be able to properly measure the value of possible outcomes. The value of a football play has traditionally been measured in yards gained. Unfortunately, yards is a flawed measure because not all yards are equal. For example, a 4-yard gain on 3rd down and 3 is much more valuable than a 4-yard gain on 3rd and 8. Any measure of success must consider the down and distance situation. Field position is also an important consideration. Yards gained near the goal line are tougher to come by and are more valuable than yards gained at midfield. Yards lost near one’s own goal line can be more costly as well. We can measure the values of situations and, by extension, the outcomes of plays by establishing an equivalence in terms of points. To do this we can start by looking back through recent NFL history at the ‘next points scored’ for all plays. For example, if we look at all 1st and 10s from an offense’ own 20-yard line, the team on offense will score next slightly more often than its opponent. If we add up all the ‘next points’ scored for and against the offense’s team, whether on the current drive or subsequent drives, we can estimate the net point advantage an offense can expect for any football situation. For a 1st and 10 at an offense’s own 20, it’s +0.4 net points, and at the opponent’s 20, it’s +4.0 net points. These net point values are called Expected Points (EP), and every down-distance-field position situation has a corresponding EP value. Suppose the offense has a 1st and 10 at midfield. This situation is worth +2.0 EP. A 5-yard gain would set up a 2nd and 5 from the 45, which corresponds to a +2.1 EP. Therefore, that 5-yard gain in that particular situation represents a +0.1 gain in EP. This gain is called Expected Points Added (EPA). Likewise, a 5-yard loss on 1st down at midfield would create a 2nd and 15 from the offense’s own 45. That situation is worth +1.2 EP, representing a net difference of -0.8 EPA. We can value turnovers in the same way. Suppose that on 2nd and 5 at the opponent’s 45 there was a fumble recovered by the defense. The 2nd and 5 was worth +2.2 EP, but now the opponent has a 1st and 10 on their own 45, worth +2.1 EP to them. The result of the play represents -2.1 EP for the original offense for a net loss of -4.3 EP. On average, a fumble in that situation means a net expected loss of a little more than 4 points. To be of good use for most kinds of analysis, we need the measure of success to be linear. In this case, that means that a +2 EP is exactly twice as good as +1 EP, that +4 EP is twice as good as +2 EP, and so on. We need linearity when we analyze decisions. For example, what would you rather have a 100% chance of +3 EP, or would you rather have a 60% chance at +6 EP with a 40% chance of 0 EP? To answer this question definitively, each net point of advantage must be equally valuable to a team. But there’s a problem. We all know that being up by 1 point at the end of a game is just as good as being up by 50. Not all points are equally valuable. Teams well ahead will sacrifice point advantages in exchange for running time off the clock, which in the end helps them win. To mitigate that problem, the baseline EP values for each down-distance-field position situation must be created based on real game situations when points are equally valuable and time is not yet a factor. The baseline EP values are therefore based only on game situations when the score was within 10 points and in the first and third quarters. This eliminates situations like ‘trash time,’ and other distortions. EP and EPA have a variety of applications. We can use EP to measure and compare the relative value of runs vs. passes in various situations. We can tally up the EPA for individual players and for teams for a more accurate valuation than what traditional stats can tell us. Perhaps the most useful application of EP is in the analysis of fourth down decisions, which suggests teams should be going for it far more often. For an example of what EP values look like on first down, see the chart below. For second and third downs, see this post.